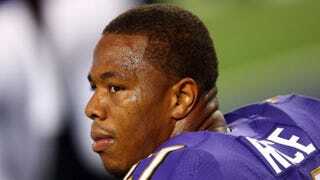 Former Baltimore Ravens running back Ray Rice reportedly has plans to appeal the indefinite suspension levied against him by the NFL after TMZ released video footage of Rice striking his then-fiancee, Janay Palmer, in a casino elevator. Sources told ESPN that Rice, who was released last Monday by the Ravens, has up to 11:59 p.m. Tuesday to appeal the NFL's decision. According to ESPN, "The NFLPA [NFL Players Association] still has not finalized its plan on a basis for the appeal and is considering multiple ideas." The NFL and Ravens have been the target of harsh criticism after both failed to issue harsh punishments against the Pro Bowler for the February assault. Reports claim that the NFL was aware of the severity of the assault and yet initially issued a two-game ban against Rice, while the Ravens did not punish Rice. Both the NFL and the Ravens claimed that they had not seen the video footage until last Monday.